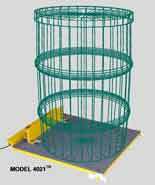 The Model 4021™ Ultra-Low Profile Digital DRUM Scale is designed for greater ease in occasional on/off loading of 18" to 26" diameter drums. Model 4021™ has a 4-20mA output signal and 85/265 VAC standard. It comes standard with the Scaletron 2nd generation 3-1/2 digit knob tare indicator. The base features an adjustable heavy duty backstop that will accommodate a range of drum diameters. The Scaletron 4-1/2 digit knob tare indicator or Model 1099™ Chemical Process Controller are available as options. Scaletron offers Total Electronic Chemical Process Control and manufactures a complete line of scales and accessories specifically designed for the harsh environments of the drinking water and wastewater treatment industry.